The turbine at the bottom of Cobscook Bay can generate 180 kilowatts of electricity, enough to power 30 homes. PORTLAND — Tidal power has reached a new milestone in North America. Maine’s Ocean Renewable Power Co. has started generating electricity for the power grid from its tidal energy turbine on the bottom of Cobscook Bay near Lubec, in easternmost Maine. It is the first commercial tidal energy project to do so in North America, beating larger rivals who have tested or plan to test devices of their own in the Bay of Fundy region. Company spokeswoman Susy Kist confirmed Thursday that the turbine has been generating power for the grid. She said power started flowing nearly two weeks ago, but the company had been waiting to announce the milestone until local utility Bangor Hydro had an opportunity to confirm it. The turbine can generate 180 kilowatts of electricity, enough to power 30 homes, according to The New York Times. “Everything is working as it should be and we are sending power to the grid,” Kist said. Bangor Hydro — which owns the lines in Lubec that connect to the submerged turbine — verified that power was being delivered to the grid just before 2 p.m. Thursday. The Eastport area has Maine’s highest tides — 20 feet — because it is perched at the mouth of the vast Bay of Fundy. 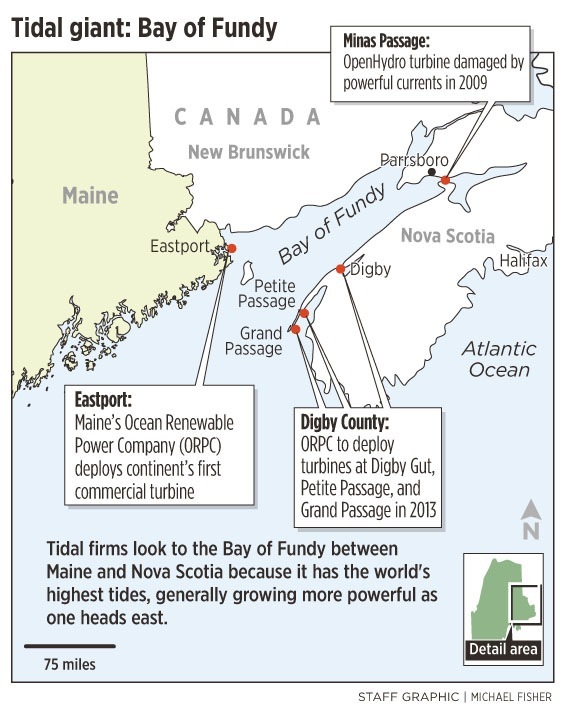 The Bay of Fundy has the world’s highest tides — more than 50 feet near the head of the bay in Nova Scotia — and Ocean Renewable and its U.S. and European rivals are competing to harness its energy. 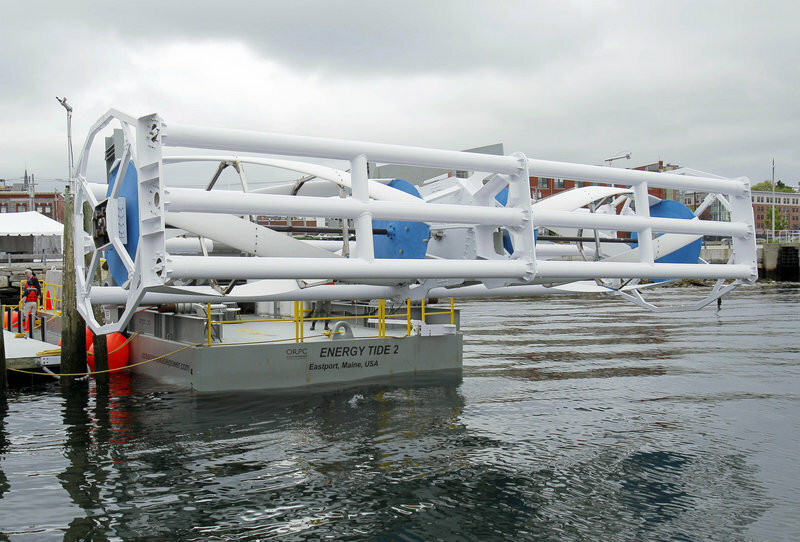 The new tidal technologies are inspired by wind turbines and require no dam. Devices like the one that Ocean Renewable has installed near Lubec are mounted on the sea floor, where they slowly spin in the current, out of sight and well beneath the hulls of passing vessels. Tests so far suggest the turbines have no effect on marine life, which appears to have no difficulty detecting and swimming around them. Ocean Renewable is based in Portland, with primary field operations in Eastport.